The Mile High Business Alliance is working on it's new edition of the East Colfax Local Flavor Guide™. 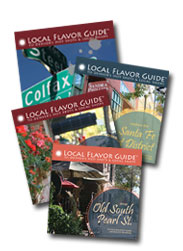 Local Flavor Guides™ are full color, easy-to-carry brochures that feature one-of-a-kind Colorado businesses just waiting to be discovered. Great for locals and visitors alike! Local Flavor Guides™ are a project of the Mile High Business Alliance, a Denver-based organization committed to strengthening local business. Tattered Cover and Twist & Shout are co-sponsoring the guide along with the Department of Environmental Health. The boundaries of the East Colfax guide are Josephine St. to Colorado Blvd. If your business is within that area, please contact Melanie Horton at 303-872-5646 Ext. 405 or melanie@milehighbiz.org to find out how to get your business listed as well as sponsorship opportunities.